19 yrs old Sivasakthi, hails from the remote village of Tirupathur. He lost his father in his childhood. His mother took the family’s responsibility on her shoulder. But she was unable to earn more in that village which can suffice their basic daily needs. Continuing higher studies had become a mirage for him. That was when he decided to quit his studies and started to work in a garage as a two wheeler mechanic for a daily wage of Rs. 100. It was his friend who informed him about the training and placement facilities rendered to the youth like him by Don Bosco Tech located at Tiruppatur and suggested him to join if he wants a better future and stable career. With the growing urge to become a successful person with good income he convinced his mother to join Don Bosco Tech as trainee. Finally, he joined the electrical domain after his thorough counselling as well as interest inventory test at the centre. The training was a boon for him. Within in a short period of time, he learned the trade of an electrician and was confident to find himself a job in a good organization after the training. He has showed extreme interest in learning subjects. It was his determination, hard work and focussed mind that finally took him to his successful completion of Electrical trainings. Trainers also guided and motivated all along his struggles and success. After 3 months of hard work he at last completed his training successfully. 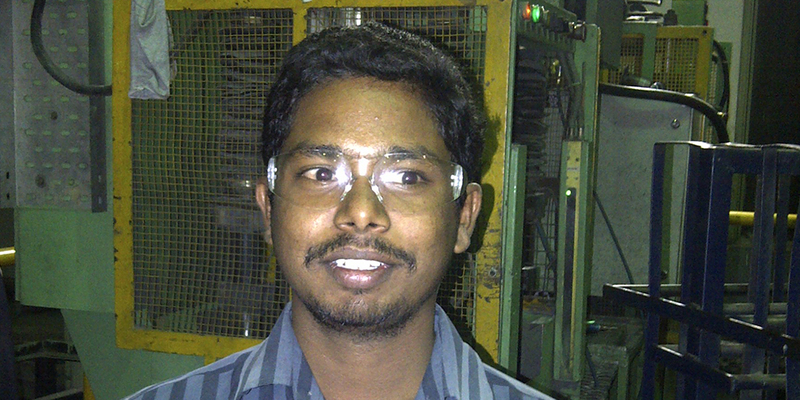 He got the placement in Sundaram Clayton Ltd located at Hosur, Tamil Nadu as a Machine Operator with a monthly remuneration of Rs. 8022/- per month. Sivasakthi mother was very happy to see her son successful, happy and content with his life and career. Like every parent, Sivasakthi mother too was concerned about the training. However, it was after a month of the commencement of Sivasakthi training, she started to notice the positive changes and progress in not only his personality but also his approach towards life and his future. Today Shivsakthit is a confident young man who is earning well and fulfilling his dream to suport his mother. He also looks forward towards more success in his career.